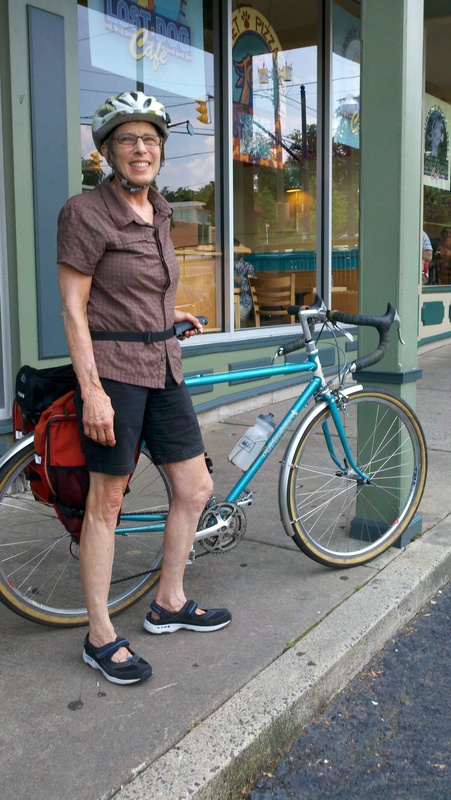 Don’t Overthink It: #BikeDC Speaks to Joan O. Now that the big vacation has ended, #BikeDC Speaks has returned to the front page! This week features a guest post from Joan O., a transportation and recreational cyclist who calls Arlington, Virginia, home. I’ve gotten to know Joan from seeing her out and about on some of the same roads I regularly travel. She’s a friendly and outgoing cyclist with a thirst for adventure. Here’s what she had to say about riding in the Washington, D.C. area. Grocery shopping, pet store, hardware store. Getting a haircut, visiting museums, going to lunch and the library, etc. All kinds of errands – and I commuted to work before I retired, both in Alexandria and downtown. I use panniers and have a pull-behind trailer when I have to get bulky items. I also drive my car to the surrounding countryside so I can ride my bike in rural, low-traffic places. That is relaxing no matter how slow or fast I ride my bike or how far, because it’s scenic and not urban. It’s easy to find routes to get almost anywhere. Getting places on my bike is easy. And I like that there’s a strong bike culture here that emphasizes using a bike for transportation. The D.C. area is a fair distance away from great rural riding. Drivers – so many drivers here act as if they are always more important than the next person (whether that other person is on foot, in a car or on a bike). I find most of Arlington and D.C. fairly bike-friendly. I can usually find a decent biking route to many destinations. I’ve ridden in downtown a lot, through downtown up to Silver Spring and Kensington and Bethesda, and also to Southwest DC. I generally ride cautiously and try to also ride predictably. I do stop at stop signs and red lights. I think that helps let drivers know that I’m trying to be careful. All that said, I admit that I will cut the lane when traffic is very backed up. I have to say that M street through Georgetown in rush hour is a bit of a challenge. I like Capital Bikeshare. The more people on bikes, the more drivers are aware of bikers. The more people biking in “regular” clothes, the more other people and drivers realize that biking is transportation too. The other side of that is many of those using Capital Bikeshare aren’t really used to biking in the city and they do some stupid stuff on their bikes. But I still think the positive outweighs the negative. Just ride, just get on your bike, don’t overthink it. I use a rearview mirror; I’ve had one since the early 70’s. I believe it gives me a much better –wider and further back – field of vision behind me than turning my neck quickly. Fun. I think I always have fun on my bike. At the very least, I feel good and have a sense of accomplishment when I ride even in rain, snow, bitter cold, or dreadful traffic. I feel particularly accomplished in dreadful traffic because I can avoid getting stuck in it! So true! The bike offers an agility in urban areas that is not available to cars. Great reflections, Joan. Thanks so much for being part of #BikeDC Speaks, and I look forward to seeing you out on the road! How could you not have fun riding around on that Bleriot? Nice interview. Fun. Yes! You nailed it, Joan.